This diagram helps to explain the probability of disease to laymen in Genetic Counselling. The type of blood protein we possess, like every human characteristic, is coded in our genes. Normal Adult Haemoglobin, the red protein in the 'red blood corpuscles', designated Haemoglobin Type A, (nothing to do with Blood Group A), remains 'fluid' even in the absence of oxygen. Sometimes we find genes coding for haemoglobins which differ from normal haemoglobin in certain respects.The best known non-A Haemoglobin has been designated haemoglobin S because, in the absence of oxygen, this haemoglobin solidifies, distorting the red cell membrane, turning it sickle shape. In southern Ghana, 20% of people have inherited a Normal haemoglobin A from one parent, and the 'abnormal' Haemoglobin S from the other parent, giving them the AS phenotype (known as the Sickle Cell Trait). They do not know they have inherited any such thing because the AS Trait person looks exactly like an AA person. Another 10% of southern Ghanaians are found on special tests to have the AC phenotype, ie one parent has passed on a gene which codes for Normal haemoglobin A, while the other passed on another non-A Haemoglobin Type called Haemoglobin C. In northern Ghana the reverse is the case: 10% have the Sickle Cell Trait AS, while 20% have Haemoglobin C Trait. Taking the country as a whole, therefore, 1 in 3 of all Ghanaians possess one abnormal haemoglobin trait (AS or AC). I was not surprised to find that my father was AC, and my mother AS. Nor is it rare to find, as shown in the picture above, a Sickle Cell Trait man (AS) taking a Sickle Cell Trait (AS) wife, with neither of them knowing they have anything called 'sickle cell' because they are perfectly well. The diagram above tells you what can, and does, happen. Please try and follow this: With sexual union, the man discharges millions and millions of sperm into the woman. Each of these sperm contains just one, not both, of the man's genes for the various human characteristics. One sperm will contain the code for producing Normal haemoglobin A, (which I call NORM) while another sperm contains the code for sickle haemoglobin S (ACHE). These sperm are all competing to get to the woman's egg to fertilise it, but the egg (or ovum) produced that particular month, (and which will be discarded with her periods if no fertilisation takes place) also contains just one, not both of the genes A (NORM) or S (ACHE). Look at the diagram again to follow this. If the sperm carrying the A code fertilises an A-carrying ovum, you have a fetus with the AA (NORMNORM) phenotype which will develop into a child with no abnormal haemoglobin disease. If an A-carrying sperm accosts an S-carrying egg, and something comes of it you have a child with the AS phenotype (NORMACHE) also with no abnormal haemoglobin disease. Indeed, nobody knows that the child (who grows into an adult) is carrying a sickle haemoglobin (ACHE) until someone tests the blood. Similarly, if an S-coded sperm fertilises an egg which is carrying the code for Normal adult haemoglobin A, you will have a sickle cell trait child born (SA or AS or NORMACHE), and no disease ensues. Indeed, no one knows about the carrier state until some one decides to test the blood. However, if a sperm with S code fertilises an egg produced that particular month also with an S code, then the fertilised egg has the SS phenotype and the child will have sickle cell disease ACHEACHE, the cardinal African feature of which is periodic aches in the rainy season. Since it needs a double abnormal haemoglobin code to produce 'cold-season rheumatism' (or the tribal 'chwechweechwe/hemkom' which I became the first to point out was identical with what the Americans described in 1910 as 'Sickle Cell Anaemia'), I designated it 'ACHEACHE’. Normal Haemoglobin A so dilutes the S haemoglobin that the carrier AS NORMACHE is not even aware that he/she is carrying anything that can cause aches in the next generation. Look again at the diagram. There is always a 1 in 4 chance of each pregnancy ending up with an Ache/Ache child. It never should be interpreted to mean that if the first child is SS, then the second child can never be SS. Or that if a couple have 4 children all whom are AA, then it is proof that they can never be sickle cell trait carriers. I have seen a Consultant Physician, whose wife is also a Doctor become greatly puzzled when their 5th "unplanned" child turned out to be SS. That was the first time they tested themselves and found that they both had been carriers all along. They had over the years enjoyed a 3 in 4 chance of not having a sickle cell disease child in spite of being AS parents. I also have the T-S Family of Ghana, Sickle Cell Trait parents whose first child was SS, second child SS, third child SS, and fourth child SS. For those interested in elementary mathematics, the chances that that did happen were (1 in 4) x (1 in 4) x (1 in 4) x (1 in 4) = 1 in 256. Relatively infrequent, but it did happen. Each pregnancy is what we are talking about. Remember that! 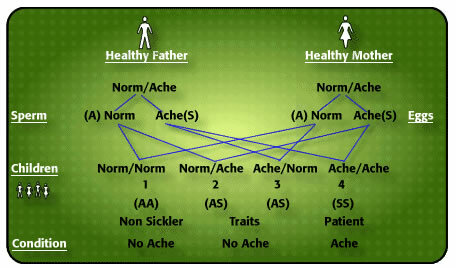 Now work out the chances of sickle cell disease in the offspring when one parent has sickle trait (AS or Norm/Ache) and the other has sickle cell disease (SS or Ache/Ache). Would you agree that the chances of sickle cell disease in the offspring would be 50% ie every other child born? What about a sickle cell disease person marrying another sickle cell disease person? Well, Bela Ringelhann and I found such a family (See Publications). They had 13 children. The Ache/Ache father and Ache/Ache mother produced 13 Ache/Ache children (100% ABNORMAL HAEMOGLOBIN INCIDENCE). They gave permission for their photograph to be published on the cover of my 'The Sickle Cell Disease Patient', advising that people should take Genetic Counselling seriously. Information about this will appear in a blog article at a later date.